If seeing the cover photo of this album doesn't make you want to listen to it, obsess over it and consider it one of the coolest things in your collection - you just might not be human. Eddie Gale standing hooded with shades, his trumpet in hand, with a canine ready to rip your skull off. His backing musicians for the record, similarly hooded, with different instruments, expressionless facades on their face. They have attained a higher power through music and their look is forcing you to follow suit. Powerful. During the late 60's, every important jazz musician tried their hand at the spiritual jazz movement that Coltrane spawned and mastered. While this resulted in some of the most exciting and invigorating jazz music that exists today, it also caused a plethora of great musicians to release lackluster work just for the sake of being "experimental." Prior to 1968, Eddie Gale was known as a backing musician of various forms of Sun Ra's Arkestra, as well as playing on Cecil Taylor's Blue Note debut. These are big names and by the time that Gale was set to release his debut under his own name - the recording was entirely funded by Blue Note co-founder Francis Wolff, who believed that what Gale was accomplishing with this record was something that could truly shape what jazz is perceived to be and where it can go. And with good reason. Despite the fact that Eddie Gale's Ghetto Music remained one of the most obscure Blue Note releases for years and has since been remastered on an entirely different label, the album continues to stick out amongst a catalogue of some of the best music the world has ever seen. The deeply moving album opens with "The Rain" beginning with acoustic guitar and Eddie's sister Joann singing in a style that doesn't seem far removed from Fairport Convention. At 40 seconds, the rest of the 17-member ensemble reveals themselves, a jazz beat pushed along by the two basses and two drummers, the 11 member chorus preaching the gospel. The song alternates between these pastoral folk passages and the louder ensemble moments, with Eddie's trumpet soloing in between. Soon Eddie and his sister find themselves in a duet, his trumpet much louder than her voice. The track builds and builds, repeating "Stop the rain...Stop the rain." When listening, it is hard to think of a more powerful opening track through any genre of music. The next 4 tracks continue the wave of blending gospel and jazz and a little funk, create mass amounts of cacophony that never quite sound like "noise." Gale retains the ability to reign his ensemble inward at the proper time, continuously create musical passages that layer themselves to the point of bursting, before stopping and allowing breath. The chorus keeps things interesting throughout the 40-minute duration, making themselves apparent and noticeable, but never the center of attention, which rightly belongs to the amazing instrumental work. 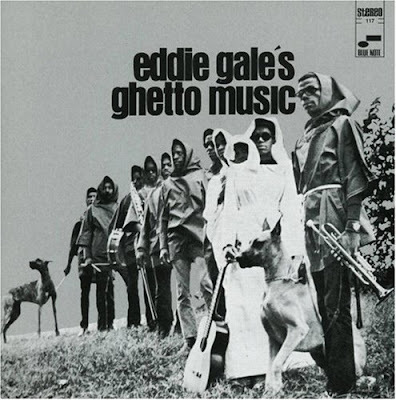 Eddie Gale's Ghetto Music is one of the best spiritual / protest jazz albums that exists. A snapshot of life in 1968 and one that can still ring true as a snapshot of life in 2010. Powerful music.